In attempt to make the movie experience even more exciting, mmCineplexes offers several discount offers and promo codes. Here we bring you some of the mnCineplexes promo offers available for customers. Visit selected mmCineplexes cinema and get your favourite F&B combo selection to receive a packet of Marvel Studios' Captain Marvel CNY Ang Pao! Save RM2 If You Buy Pasta! Exclusively at mmCineplexes City Square, Johor Bahru and eCurve, Damansara, enjoy RM2 off if you buy the Spaghetti Bolognese for both ala carte or combo. Every Tuesday for movies before 11PM, ladies pay for tickets starting from only RM8. Promotion start date is to be revealed. Promotion is only available on Tuesdays (excluding public holidays). Promotion is only valid for movies before 11pm. Ladies Movie Day Prices are per movie ticket. One lady will be entitled to one Ladies Movie Day priced ticket. Ticket prices may vary depending on the movie status (blockbuster or non-blockbuster) and location. Promotion is not applicable for Platinum Movie Suites, Tamil and Hindi movies, twin seats, 3D, and Dolby Atmos at Damansara eCurve, City Square JB, Prai, Bertam, and Langkawi. Sometimes being a student means being on a budget because of your allowance. But don't let that stop you from watching your favourite new movies. 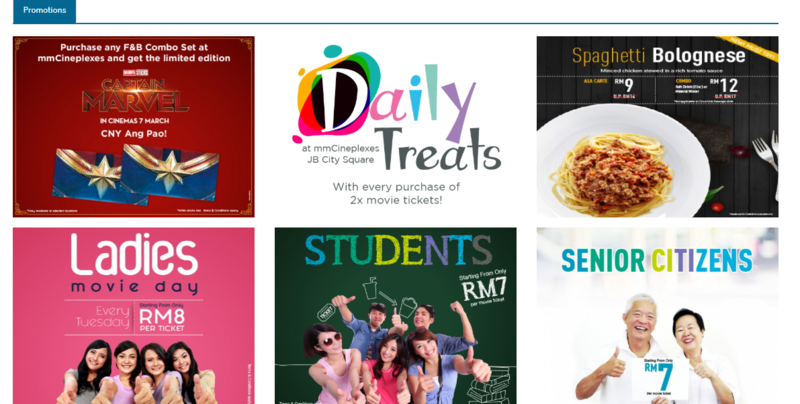 Watch the latest blockbusters only from RM7 onwards per movie ticket for students. Applicable price and movies may vary depending on location. Valid for students (show a valid student ID). Not applicable at Platinum Movie Suites. This promotion is not valid with any other promotions and credit card discount in part or full. The management reserves the right to alter the terms of this promotion without prior notice and by you participating on this promotion, you are deemed eligible that you have agreed on the terms & conditions set by the management. Getting older can be a good thing, which is why senior citizens will receive a special price from RM7 only per movie ticket. Valid for senior citizens above age 55 (show IC). Not applicable for blockbuster movies, 3D movies, Tamil & Hindi movies. Free small popcorn redemption is based on first 20 redemptions per day (only available at mmCineplexes eCurve and mmCineplexes JB City Square). Customers purchasing their tickets from mmCineplexes in Malaysia can enjoy several additional discounts and benefits when they buy via ShopBack. Here, one can not only view any available mmCineplexes discount codes, but also get additional cashback with every purchase through ShopBack. In addition, you can also follow the brand on their social media such as Instagram, Facebook and Twitter for the latest updates. mmCineplexes are among the leading cinema brands in Malaysia and operate under mm2 Entertainment, a wholly owned subsidiary of mm2 Asia Ltd. mm2 Entertainment is Singapore’s leading media entertainment and content company with regional offices in several locations across the world. The company entered the Malaysian cinematic world through the acquisition of Cathay Cineplexes Malaysia and Mega Cinemas present at two prominent locations, mmCineplexes city square JB and mmCineplexes Damansara PJ. MM2 acquired Cathay Cineplexes Malaysia and Mega Cinemas in 2015, marking its presence in Malaysia in a significant manner. The mmCineplexes city square location is a popular point for movie goers and cinema enthusiasts. At present, the Group is the only presence with cinemas in both Singapore and Malaysia, having a total of 206 screens in 27 locations. The company is a leading producer of films and TV content including digital creations. MM2 Asia is known for its participation across several verticals of the film making business from financing to production and distribution among others. From action to rom-coms and even drama, people of all age groups and genre preferences can find their favourite movies here. With the prime location at mmCineplexes city square, this is one of the most popular cinemas in the region. Here, we take a look at the types of media content available on the screens. Booking your tickets for your favourite movie has never been easier. Here we bring you the steps you need to follow to book your favourite show. Step 1: On the homepage, enter the details of the movie name, cinema, date and show that you want. In addition, you can also click on the ‘Showtimes’ tab and view and select from all the movies currently available. Step 2: Before you can move ahead, you will be shown the rating for the particular movie and if it has any age restriction. Click on ‘continue’ if it is acceptable. Step 3: You will now be able to choose your seat. 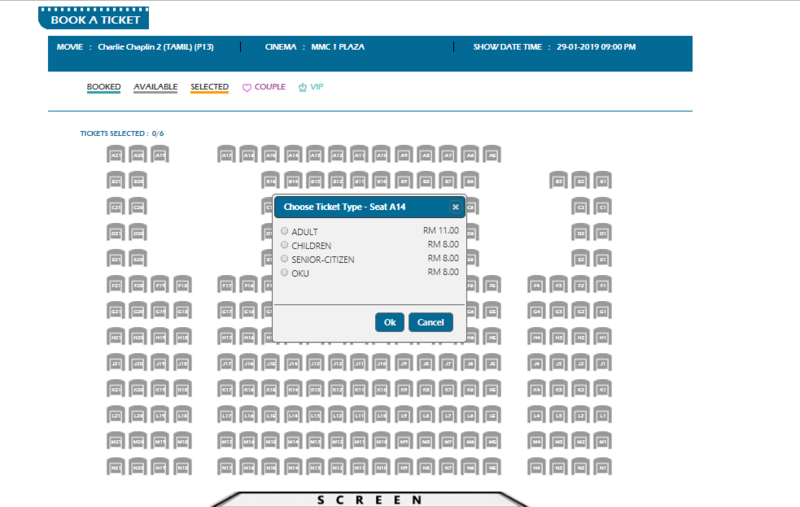 For each seat an option will be displayed with the relevant price, such as adult, child, senior citizen or OKU. Click on the one that is applicable and select ‘Continue’. 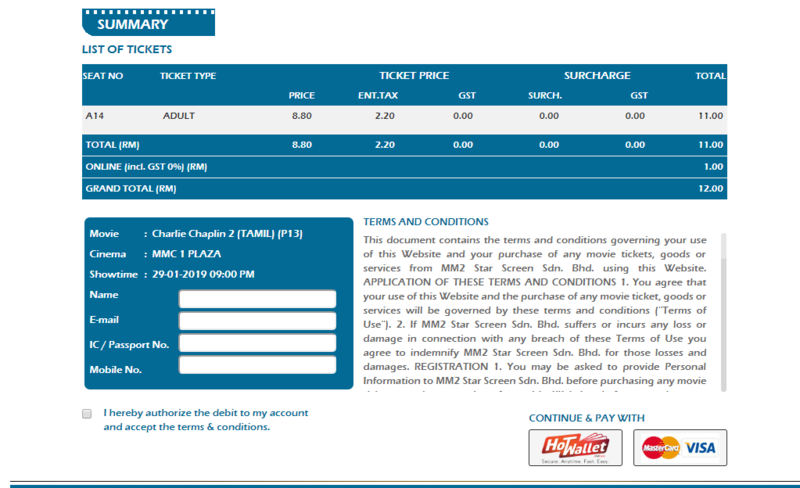 Step 4: Next you will be able to see the summary of your tickets booked. Be sure to review them carefully before entering your account details and making the payment. In case you have an mmCineplexes promo code, be sure to enter it in the field given while making your payment. Step 5: Once you have completed your payment, you will receive your ticket details on your phone by text or email. If you are tired of seminars or product launches at the usual places, simply switch to luxurious comfort of the platinum suite. These reclining seats with a great food menu are also ideal for birthday celebrations with loved ones. To book a platinum suite, you can contact the customer care team at 03-7727 0724 or email them at corpbookings@mmcineplexes.com. Step 1: Visit the ShopBack website and click on the mmCineplexes link at the bottom of the homepage. You can also use the search box to find the link to the store. Step 3: Look for the latest mmCineplexes promo code or mmCineplexes coupon in the voucher codes, discount codes and coupons section. Step 4: You will be redirected to the mmCineplexes website to browse and select the items. By presenting the booking confirmation number for the transaction at the ticket counter or the ticket dispensing kiosk at the respective location (wherever available). By printing the ticket at home and presenting the print out at the ticket tearing point to gain admission to the selected movie session. The unique barcode on the ticket can only be used once. Please note that the Head Office operates Mon to Fri (excluding Public Holidays), 9am to 6pm. For Movie Enquiries & Feedback, please email feedback@mmcineplexes.com.